Want to find a way to retire sooner, live a higher quality of life with less stress. Please take a few minutes and tour our website. Whether you are looking for a better quality of life, a vacation home, a rental property that provides great returns, a more affordable retirement or to move assets offshore, Costa Rica is a wonderful, safe and stable place to do so. I encourage you to spend some time here, look at our pictures and imagine living here. You should also view our slide show below to see how Costa Rica can help you. In a nutshell: Imagine your home in a friendly community where you know your neighbors and the beach is your playground. A place known for healthy living and conservation, natural foods and abundant amenities, where you can swim in a waterfall while watching wild parrots, toucans and macaws. Where first class health care costs pennies on the dollar yet the average life expectancy is higher than the US. A community located within a few miles of the newest hospital in the country. A place where the value of your property is appreciating each year and reflects your individual taste. Pacific Lots of Costa Rica represents the largest developer on the southern Pacific coast of Costa Rica, where affordable ocean and mountain view properties as well as custom home building services will turn your dreams into reality. We provide excellent value for those looking for a better place to live. Relax, your money will go significantly further than in the US. Enjoy a quality of life we have forgotten in the US. Step away from the stresses of daily living, traffic jams and a lack of a sense of community. In retirement, your largest expenses will likely be property taxes, insurance and healthcare costs. These three expenses are significantly less in Costa Rica than in North America. National Geographic's November 2017 magazine rated Costa Rican as "The Happiest People on the Planet". 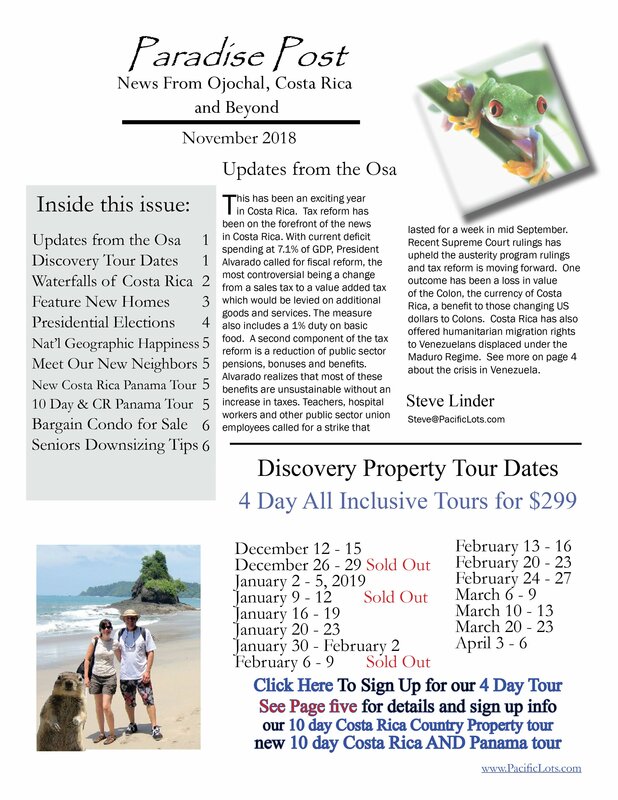 Come see us on a 4 day Costa Rica tour, sign up below, tour dates are on the left portion of the Visit Us page from the sidebar menu and also on the lower left side of the home page. Prices for home sites start at $40,000 and candidly for $40,000 to $50,000 you can buy a nice fully improved home site with road, artesian well water plumbed to the lot and electric to the lot in a large international residential gated or non gated community with a solid track record of 27 years developing land and building homes. Ocean view sites cost more, starting in the $75,000 range and the top end of our prices up to $180,000 for the best lot in the place, over an acre and with incredible ocean and mountain view. It’s easy enough to go to the top of the hill and see the view when you want to and our inexpensive lots typically have great mountain or jungle views. The development is firmly established, debt free and with nearly all infrastructure completed in 17 phases spanning over 11 miles along the coastal community in the southern Pacific region of Costa Rica. The developer has built hundreds of custom homes. We have over a thousand owners and don't need to show people "artists renditions" of what the development will look like some day. If a development you are considering hasn't gotten their permits, roads, water, electric, experience building homes, etc... be prepared for the potential that they may never complete what you were promised. Buy what you see, not what they tell you. Now in our twenty seventh year, you can rest assured that you will not be stuck "holding the bag". Also realize if you are buying in a smaller development, your circle of friends might be limited, especially in off season. Living in a foreign country and feeling alone is not worth a bargain price. We’re building custom homes at $120 per square foot (very nice) so you can easily get in a home for under $200k including land if you don’t want a mansion or a killer ocean view. You can build your own house or hire any builder of your choice and have no time limit to build. The home sites are in nicely laid out developments only a few minutes from the highway but the terrain makes 4 wheel drive pretty much a necessity within the developments. The roads within the developments are gravel, better than you might expect paying only a few hundred dollars in property taxes per year but still gravel. HOA fees within our developments average around $30 per month since we don’t encumber our owners with common area amenities like club houses, community pools, etc. There are plenty of places to socialize and with beautiful public beaches and plenty of clean warm mountain rivers to swim in, you can live nicely on a tiny budget if you choose to. We have plenty of rich residents as well with big impressive homes and incredible views but we also have many humble folks living in smaller homes, the choice is yours depending on your budget and your dreams. 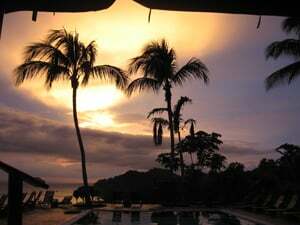 For photos of some of the Custom Homes in Costa Rica we've built, click here. Our area is an emerging one, not a big city but more like a jungle village growing quickly, a village but with great restaurants, a dozen hotels, easy grocery shopping with anything available including things you would not expect to be able to find (caviar, single malt scotch, Cuban cigars, French wines) literally anything you can get in the states. We have local farmers markets, butcher shops, organic dairy products, fish markets, bigger grocery stores, even Walmart and PriceSmart if you want to drive a bit. As the influx of baby boomers continues to head our way the community has been growing quickly. We've got golf, ATV rentals, horseback tours, white water rafting, zip-lining, national parks, sport fishing, and more within a 30 minute drive. We've also got a brand new hospital with a first rate emergency center and cardiology department. Affordability in our area is not the issue, believing that a small town such as ours in an area of the world that continues to grow rapidly will be enough to entertain and sustain you is the biggest hurdle most people find. In reality our life is simpler, less stressful and not focused on consumerism. We have everything you need, good healthcare, great food, a great sustainable community where you know your neighbors, an outdoor approach to life with more exercise, better food sources, clean water, excellent year round weather and low stress living. One thing you can expect is a longer, healthier life than if you stay in the states or Canada. And you don't need to maintain health insurance for Obamacare if you don't live in the US. Health insurance in Costa Rica is much less expensive than in the US depending on where you live in the US. Background: The region around the Osa Peninsula is often compared to the Galapagos Islands. This area is home to more lowland forest than anywhere else on the entire Pacific coast. There are towering trees, scenic waterfalls and sweeping sandy beaches. A dizzying amount of the world’s biodiversity can be found in this area of Costa Rica. In fact Costa Rica contains twice the number of species than the entire United States while the US contains over 200 times more land. Though only 30% of the land area of Costa Rica, the Osa region in the southern Pacific contains over 50% of animal and plant species of the entire country. This is pretty amazing considering that Costa Rica is home to nearly 5% of all the animals, plants and birds on the entire planet while encompassing only .02 of 1% of the entire earth's land mass. We represent the largest expat residential community in Costa Rica. Our temperatures are in the 80's year round though in a few months it will definitely feel like the 90's during the height of the day but it will cool down at night. Our village has a mix of age groups and nationalities. We are an international community and there are roughly 3000 people living in the village in high season right now, but things are growing fast. The southern region of Costa Rica has always been hard to get to but that does not mean that many people were not settling in that area. I encourage you to come on down and take a look, our discovery tours are a great and affordable way to visit and airfare continues to be very inexpensive now that nearly every major carrier; Delta, American, Continental, US Air, United, Spirit Air, Jet Blue, Westjet, Frontier, Mexicana, Lacsa, Taca, Iberia, Air France, British Air and Air Canada offer service there. Wherever you end up, accessibility is key. Getting to and from Costa Rica is easy and flights are often less than $300 round trip from some markets. Costa Rica is safe, friendly, stable, affordable, beautiful, inexpensive and offers great health care. You won't see military presence, automatic weapons or guards outside a donut shop. When compared to places like Ecuador, Costa Rica is much more first world with better communications, nicer amenities, more flight options, lots of tourism infrastructure and incredibly friendly people. What are you waiting for? Recent Changes: In January of 2010 two new highways were finally completed, the Caldera highway stretching from San Jose to the Pacific coast and the Costanera connecting Quepos to Dominical. These two improvements made the drive from San Jose to the southern region an attractive three hour drive through some of the most scenic parts of the country. It also made the towns of Ojochal, Tres Rios de Coronado and Chontales much more accessible. This area is home to Pacific Lots, the largest and oldest International residential development for North Americans in the region. Whether you are an individual buyer or a Costa Rica realtor, you will see why we are the most popular Costa Rican real estate project in the country. 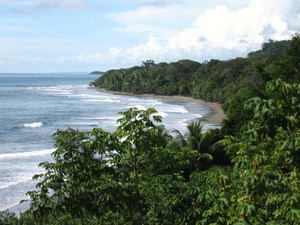 This area is considered the southern Pacific region of Costa Rica and is located just above the Osa Peninsula. These three towns touch one another as you drive south on the Pacific Coast. This area is located about 15 miles south of Dominical and about 30 miles south of Quepos. This coastal Pacific community is in one of the few areas of Costa Rica where 6000 foot tall mountains come right down to the sea. This stunning geography provides some great views. This area of the country is also more tightly zoned and construction is limited to three stories. There are no big developments and the area has become a Luxury International Residential Community of single family homes. The area is also home to some of the most famous beaches in Costa Rica, Playa Ballena (a Marine National Park), Playa Tortuga, Playa Ventanas and Playa Pinuella. Lots start at only 40k and all homes are custom built. Clients who have purchased home sites within any of the developments have no time limits to build nor restrictions on who can build their home. Clients can build their own home or hire any builder of their choice, however most clients use our building services to take advantage of our expertise and quality design and construction. Our homes are truly spectacular and one of the best real estate values in Costa Rica. Our homes are not inexpensive, good assets cost money but we can build you a custom home of your dreams with prices comparable to the US, but once built, the holding cost is significantly less than a home in the US. Our customers are mainly North Americans buying land for their future with many opting to build their dream home right away. Lately we have been getting many more Europeans as well as other international buyers. We've got clients from Australia, Russia, the UK and many parts of South America. Some are investors, holding real estate as a way to preserve the value of their assets as the value of the dollar continues to fall. Others are buying now for their planned retirement in the future. Some are just looking for a change of life, fed up with hectic pace in North America. Many of our clients are baby boomers looking for a lower cost retirement. A surprising amount of our clients are concerned about the economic outlook in the US and worldwide and are looking to protect their hard earned assets by moving some of them out of the US. We are building primary homes, rental properties, second homes and vacation homes. Demand for rentals in our area has been very strong and continues to grow as the new international airport and major highway projects are completed. 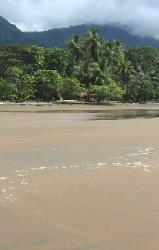 Contact us to arrange a visit to the properties and discover why so many people are relocating to Costa Rica. The low cost of living, high quality affordable health care and the great quality of life are hard to find elsewhere on the planet. Find out what Pura Vida "Pure Life" is all about. All it takes is a few days here to realize why so many are choosing Costa Rica for their future. Hope to see you here soon! One thing to keep in mind when looking at other developments worldwide is how far along they are. Ask questions like do they have all their permits in place, how many people will eventually live there and how many are living there now? Do they offer financing and have they used debt to finance their developments? There are many real estate projects in foreign retirement communities that are in their infancy or have relied on bank financing. An economic downturn can put the developer out of business Our project is entirely debt free. Due to previous downturns in the world economy, there have been a number of real estate projects in Costa Rica and elsewhere in the world that have run out of steam and left owners without promised infrastructure. Many of these developers had planned on future sales to pay for the completion of the project. These sales did not materialize, leaving a small group of owners to secure permits, electric, water, roads etc on their own and at their own expense after the developer files for bankruptcy. Many of these projects will never be completed and buyers within these developments were faced with completing enough infrastructure to enable them to live there with many losing the total value of the investment. Another thing to consider when choosing a place to live abroad is the quality and dependability of the water supply. Many areas around the world are facing limited water supplies or poor water quality. We have an excellent supply of great quality water and take pride in the distribution systems in our developments. We offer 4 day Discovery tours almost every month, typically 2 to 4 per month. We are the largest residential project in Costa Rica. Our projects cover 3200 acres in 17 phases of development. We have our own workshop where we make all our own custom windows, doors, cabinets, wrought iron work, counters, etc. 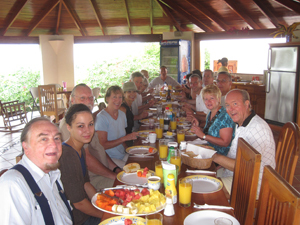 On our tours we provide full transportation to and from San Jose as well as 3 nights lodging. Although we are the largest project in Costa Rica, we do not offer "walk in tours" since it does not provide enough time to understand what we are all about. Our tour includes lodging, meals and adult beverages, airport taxi fare and hotel drop off service after our tour and all transportation within Costa Rica. We charge $299 for our visit per person but we apply a $1000 credit to any purchase to offset travel expenses, the discount taken off the price of any home site. We offer full financing as well as a 5% discount for non financed purchases. Our firm is debt free and all of our home sites are fully improved with road, artesian well water at the lot line and electric to each lot. We are the largest builder of custom homes in the country and have over 300 full time employees. We also have a brand new golf course only 2 miles from our developments. We've had many International Living and Pathfinder readers visit a variety of "Chill Weekends" with other developers in various countries tell us that ours is the best one offered. Any property you purchase abroad is an asset, not an expense. Assets well chosen will appreciate in value. The cost of living (expense) in Costa Rica is as cheap as Panama, Ecuador or Mexico and less expensive than the US. Traveling as a tourist in Costa Rica is not as inexpensive as it once was because tourism has doubled in the past 3 years alone and demand exceeds supply for tourism. But living there is a different story and surprisingly affordable. 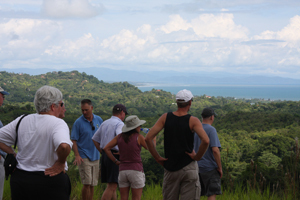 Discovery Property Tours are $299 per person 4 days all inclusive. We don't bill for the tour until a week or so before the tour. Pacific Lots of Costa Rica is a Florida based company that specializes in ocean and mountain view properties in southern Costa Rica. For Agents and Independents brokers that would like to work with Pacific Lots, please contact us for an agency agreement.